Corey Wakeling’s introduction to Outcrop: Radical Australian Poetry of Land, is a heavy read. It was written for connoisseurs of poetry, and I am not one, so most of it went over my head. I am a lover of poetry, though. Poems that are conventional in shape and yet linguistically complex resonate with me. I am also a lover of land. This land. I roadtrip often. I chase art exhibitions in Canberra and Melbourne and I visit friends who live upstate. In fact, I completed my first reading of Outcrop while on a roadtrip from Melbourne to Sydney. I followed the A1, which took me passed Eden, Bega, and Ulladulla. I could not help but see the poems in the land and the land in the poems. In Pete Spence’s poems, especially his upturned sonnet ‘Season’, I saw Melbourne’s alleyway chirpiness. In John Mateer’s ‘Auguries’, I heard birdsong and soft borders. In Peter Minter’s ‘Faecebook’, I saw sunbeams and calloused feet. And in Tim Wright’s ‘cleanskin’, I saw the peeling paint of a lakeside house in Bermagui. Astrid Lorange’s ‘Grubs’ took me from a muddy river bank near Milton to a gum-ridden motel room in Eden. Kate Fagan’s ‘Circa 1927: Realising Belief’ made me think of the purple wildflowers that spilled over the side of the highway near Nowra, nature defying human design. John Kinsella’s ‘gentle geometry’, Louis Armand’s ‘precision’, Sam Langer’s ‘mission to divide and disorientate’ – in all of that I saw straight stretches of road, bellying with hills and buckling with sky. I completed my second reading of Outcrop on a CityRail train in Sydney. With graffitied fences and rundown warehouses as my backdrop, I engaged with the collection more cerebrally. In doing so, I found many poems that conveyed a sense of urgency and decay, highlighting the “linguistic and cultural crisis” alluded to by Wakeling in the introduction. Many poems in this collection play with scale. In the poem ‘A Miniscule Map of the Country’, the poet Jill Jones connects the image of a wall map to that of a house on the fringe, and then pulled me out with cinematographic force so that I could see the whole country from the sky. With the line “And landscape looking like toast” I fell from bird’s eye height to the kitchen table; with the line “space, time and a chlorine pool” I saw the jelly blue Milky Way swirl down the plug hole of a bath tub. Dizziness, and this uncomfortable realisation: ‘When you say the word ‘country’, I don’t fully understand what you mean.’ The word conjures images of Uluru and AFL, mullets and beer bellies, but it does not conjure any concept of the size of the place. Jones’ poem forces one to see the largeness of ‘country’. In contrast, Matthew Hall’s poems force one to see the smallness of ‘country’. The poem ‘a pattern of settlement’ is a poem of components. Seeds and the scuffing of heels. The poem ‘six preludial songs’ called captivity is an ode to the minute changes in land. Pores picking up pollen, nails picking up dirt. The person is presented as out-of-place and out-of-time. Through the poems by Jones and Hall, and through experiencing Claire Potter’s wild domestic scenes and Keri Glastonbury’s sharp suburban imagery, I was forced to reconsider the words ‘land’ and ‘country’, and the cultural baggage that these words carry. These words make me picture eucalypt green and desert red. But these poems made me move vertically: they made me zoom in and notice signs of manual labour and human life; they also made me zoom out and realise the insignificance of it all. I imagine these objects in a terrace house in Sydney’s inner west. Each object is a piece of a puzzle that, once complete, reveals the persona’s dominant traits: quiet, restless. Hose’s poem settler’s mess meanders and mills. The opening five lines introduce the persona, a sailor of sorts. An indented line halfway down the page alludes to the mythology of Cooks and Banks. The poem ends solidly in the modern day with an image of a headmaster’s daughter dreaming of Chinese silk. ‘We are a potpourri of slang and attire’, the poem seems to say. Duggan and Hose’s work, along with Fiona Hile’s treatment of mind and matter and Michael Farrell’s confrontational portrayal of country, forced me to move horizontally, ant-like, and think about the narratives that make up the national identity. The archetypical Australian is a rugged worker of land and the archetypical Australian poem is a rugged ode to outback, but these poems, suburban in tone and multicultural in nature, challenge those archetypes. The overwhelming message of the collection is that there are layers in this country, perceptually and conceptually distinct. This is most likely the moral of Wakeling’s introduction, but it was one that was not accessible to me. Nicola Themistes said it with most clarity in her poem How to which hunt: “truth grows wild amidst native greens”. Shirley Lu works in the field of special education by day and reads poetry by night. Her favourite poets include Carson, Michaels, Ondaatje, and Kinsella. She also writes poetry; her poems have been published in Freckled Magazine, Thistle Magazine, A Hundred Gourds, and blackmail press. For more of her writing, visit weissewiese.tumblr.com. 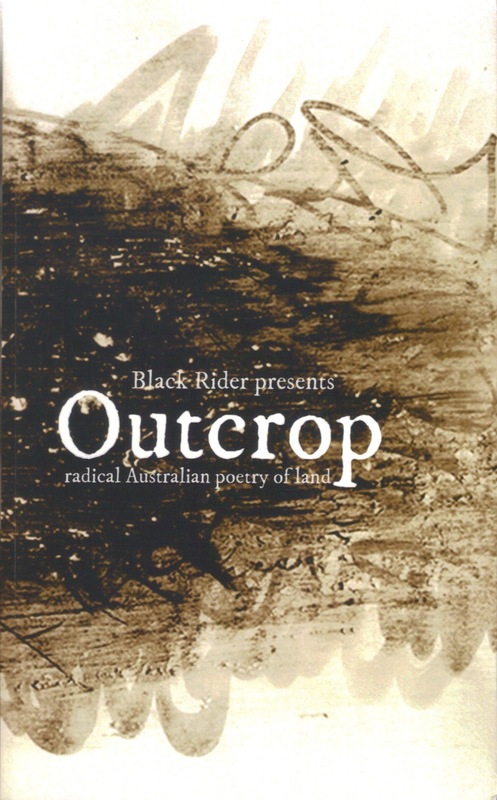 This entry was posted in Black Rider Press, Corey Wakeling, Issue 11, Jeremy Balius, Outcrop: radical Australian poetry of land, Shirley Lu and tagged Australian Literature, Australian poetry, poetry, Poetry Anthology, Radical Australian Poetry by Mark Roberts. Bookmark the permalink.